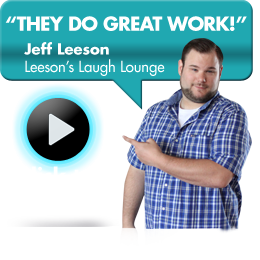 Leeson's Laugh Lounge is an online comedy show featuring comedians Jeff Leeson and Lars Classington. The show will feature celebrities, comics, sketches and live musical performances. To get the word out, Ace Web Design™ and ADARMYGROUP.COM™ designed a website that captures the atmosphere of his live tapings and gives the audience a hint of what the show is all about. Viewers can stay in touch with Jeff via his Twitter feed as well as request tickets for upcoming shows. Are you looking for a Toronto marketing expert that creates web design for comedians? Ad Army Group is a Toronto marketing expert that can provide you with all your web design and marketing needs. The agency provides marketing packages, produces slick videos, and build websites for professionals– even web design for comedians. Jeff Leeson is a gifted stand-up comedian and an accomplished actor born in London Ontario. He brought a unique brand of stand up comedy and became one of the funniest stand-up comedians in Canada. Aside from being a stand-up comedian, Jeff also performed in numerous live theatre productions. Jeff got the most coveted job of every comedian, hosting the "London Tonight with Jeff Leeson" in 2010. The late night show received several award nominations and it gained the highest ratings as an independent production on Rogers TV in London. Being hardworking and very talented in of comedy, projects came in Jeff's path. The year 2012 became the biggest year yet in Jeff's career. With 13 years in the industry, Jeff started and hosted "Leeson's Laugh Lounge in Toronto," an online comedy show. Jeff aimed to reach more audiences and bring laughter to a wider market. To bring his vision to life, he looked for a Toronto marketing expert that creates web design for comedians. He learned about the Ad Army Group and decided to get the services of this Toronto marketing expert. Ad Army Group has been providing great web design for comedians and other professionals and businesses in the Toronto area, the whole Canada, the U.S. and even in India. The Ad Army Group offers an integrated and well-rounded approach to marketing for their clients. As a Toronto marketing expert, Ad Army Group provided the whole package for bringing Jeff Leeson's brand of comedy worldwide. Ad Army Group creates web design for comedians and they built Jeff Leeson's personal website, jeffleesoncomedy.com, showing clips from Jeff's stand-up comedy stints and information for booking. The Ad Army Group also provided the website for his online show, Leesonslaughlounge.com, a show featuring Jeff Leeson and Lars Classington. Leesonslaughlounge.com shows comic sketches, live music, and celebrity interviews. Site visitors can even take a sneak peek at Jeff's live tapings. The Toronto marketing expert also provided services in Jeff's podcasts. The agency designed a podcast website for the comedian so Jeff's audiences could download and listen to all his podcasts. Even if you are not in front of your computer, you can have a laugh listening to Jeff's comic antics. Aside from the designing the websites for the comedian, the Ad Army Group created a YouTube channel and a Twitter account. Fans can keep up with the latest in Jeff's gigs through his Twitter feeds and they can even request for tickets for future shows. Paul Cookson is the brains behind bringing an innovative and dynamic marketing and web design for comedians like Jeff Leeson. Paul is the owner of Advantage Sales Group Canada Inc., a company which manages Ace Web Design, a web design studio; and Ad Army Group, an advertising agency. With Ace Web Design and Ad Army Group, Paul provides a one-stop shop for all your marketing and advertising needs. Paul is an expert marketing strategist in Toronto and advertising veteran, having more than two decades in the said fields. A graduate of advertising, he was trained to be a creative thinker and an innovator. Paul started his career in 1989 where he gained knowledge from Small Business Advertising Company's senior staff and most experienced marketing professionals. He was then recruited as General Manager of the Addiction Recovery Centre in 1991. There he was tasked to build the privately-run company from scratch. The Centre became the leading addiction treatment center in Ontario and was able to contract more employees. Under Paul's supervision, the Centre opened another office in Ottawa and sales grew to $120 thousand a month. From then on, he was employed in different capacities in the marketing industry. If you want a Toronto marketing expert to help market your business or organization, contact Paul Cookson. Aside from cool web design for comedians like that of Jeff Leeson, Paul can also offer you a marketing package to suit your needs. The amazing track record of Ad Army Group and Ace Web Design allows them to bring only the best to their clients. They are ready to satisfy their clients the Toronto area with their interactive web designs and marketing expertise. Consult with the marketing expert now. Call Paul Cookson at 416-286-2860. He is ready to discuss your business' unique situation.